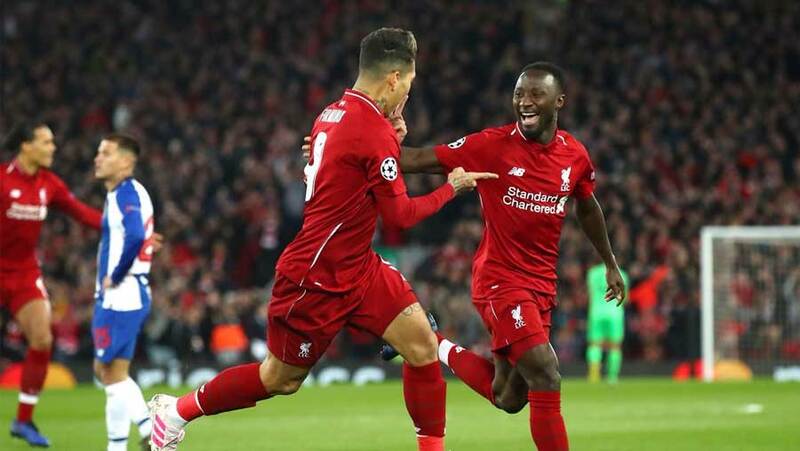 Liverpool built a 2-0 lead over FC Porto heading into the second leg of the Champions League quarterfinals thanks to first-half goals by Naby Keita and Roberto Firmino at Anfield on Tuesday (Apr 9). Liverpool took command of their UEFA Champions League quarter-final with Porto thanks to two first-half goals in the first leg at Anfield. Naby Keita put Liverpool in front in just the fifth minute when his shot from the edge of the penalty area deflected in off Oliver Torres. Roberto Firmino then tapped home the second from Trent Alexander-Arnold's cross after Jordan Henderson's fine ball from midfield. Liverpool failed to find a third goal which would have made them even more comfortable but they will head to Portugal for the second leg on Apr 17 as strong favourites to reach the semi-finals for the second-successive year.